As someone who is greatly fascinated as well as inspired by the past, especially the 60's and 70's, i felt so excited when i talked about the 40th anniversary of the expo 67. Well, imagine my enthusiasm when i found out that they were offering guided tours of the whole site of the expo - FREE!!! They're touring all the remaining landmarks erected purposely for the famous affair: The sphere, The amusement park (La Ronde), habitat 67, Parc Jean-Drapeau, the whole Ile Ste-Hélène. 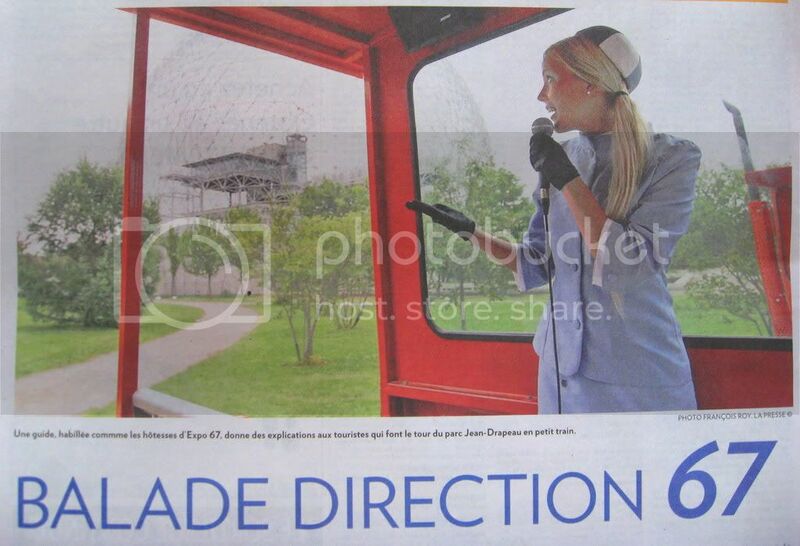 The most exciting part about it is that the tours are given by girls reincarnating the hostesses of the party - the stewardesses - as they dress the part and even change their names to honor the original ladies they are representing! I can't wait to go live my blast from the past and sit in the wagon with all the tourists wanting nothing more than me: to live (or in some cases relive!) a summer that was nothing less than unique. If you are in the Montreal area at some point before september 1rst, make sure to make your way down! For info call 514-872-6120 or visit the web site. Whatever you do, it's a necessary stop!